Mondo Exclusive Homes is a locally owned and operated custom builder dedicated to helping clients design and build their dream homes. By constantly looking at ways of improving the construction process, and by utilising the latest technology, they are able to deliver clients a high quality home with the best value for money. At Mondo Exclusive Homes, however, the goal is not just to build a superior quality home – it’s also to do it in a way that makes the process easy and enjoyable for clients. Throughout their existence, they have built a reputation for clear communication, honesty and integrity, as well as a long list of satisfied clients to attest to it. 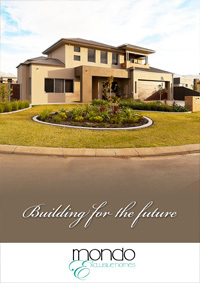 The origins of Mondo Exclusive Homes can be traced back to the founding of Kershaw Constructions as a small renovations company. 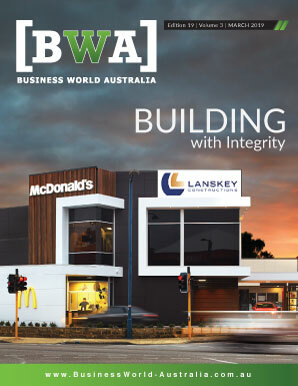 After founder and Director Ray Kershaw obtained his registered builder’s license, Kershaw Construction grew to a full-fledged construction company that did mixed-use developments, new homes, new commercial work – “a bit of everything,” Kershaw says. 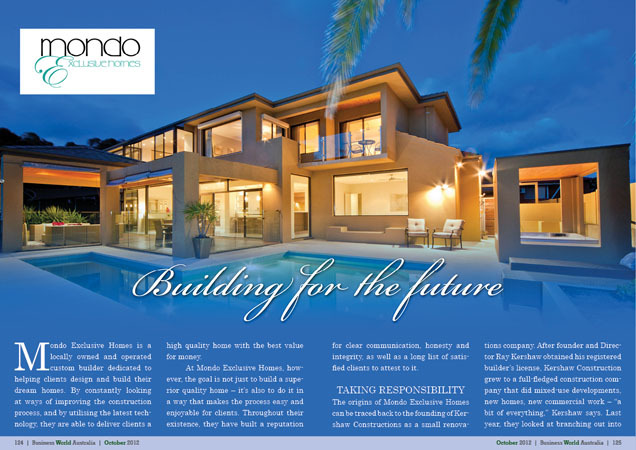 Last year, they looked at branching out into exclusive homes at the higher end of the market and created the Mondo Exclusive Homes brand name to reflect that new focus. Today, Mondo builds homes anywhere in the Perth metropolitan area, with their projects averaging around $500,000 to $600,000. When it comes to customer service, that direct access to the company’s top guy is invaluable. By dealing directly with the builder on all facets of design and construct, Mondo’s clients have both the freedom and the flexibility to design their homes around their unique needs and budget. That ability is one of the many ways Mondo Exclusive Homes has earned the loyalty of their customers. They have also set up a Facebook page for their clients, as well as the friends and family of clients. That page features interactive pictures of the construction, so as a client’s home is being built they can see the progress every step of the way. “It means they don’t have to go out there all the time,” Kershaw says. Kershaw estimates that over 60 per cent of their work is word of mouth – the very best indicator of customer satisfaction there is. “We make sure that we treat everyone well at Christmas, and everyone has a good time at our functions,” he continues. “It just keeps the morale going. I think they respect that we’re looking after them.” Mondo Exclusive Homes also pays above-board rates, maintains excellent conditions on the job site, and doesn’t skimp on materials or health and safety. “They respect us, we respect them, and we have a good relationship,” Kershaw says. Included among Mondo’s subcontractor base are their team of architects, whom they work with very closely. Kershaw himself attends all meetings between the architects and the clients, to make sure that everyone is on the same page and the client is getting exactly what they want at a good value. Like their name implies, every home that Mondo Exclusive Homes builds is one-of-a-kind. Every project is custom designed to what the client wants, though the company does specialise in two-story homes that are a bit more complex than the average job. “Sloping blocks, odd shaped blocks, small blocks – we can build on any of them,” Kershaw says.